Obstacle Course Rentals in Belchertown MA are a fun and challenging addition to any party. Kids will love racing each other through the obstacle course of pop up obstacles, crawl through tubes, a rock climb and slide of the Backyard Obstacle Course. Looking for a bigger challenge? Then the Adrenaline Rush is perfect for you, or any high school graduation party, fundraiser, school fun day, college event, or church event. For a more budget friendly obstacle course for the older kids try the Double Rush Obstacle Course rental it is the two outside pieces of the Adrenaline Rush. 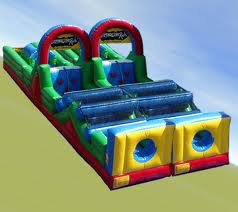 An Obstacle Course rental is also great for any school fun day event, church event or fundraiser. Two kids race each other at one time and when they are finished the next two enter which makes an obstacle course rental easy to supervise. In addition to the Belchertown MA area we also deliver to Palmer MA, Springfield MA, Longmeadow MA and more! Adrenaline Rush Call for pricing!